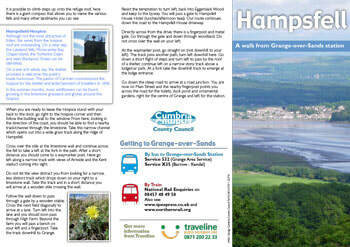 Grange-over-Sands is a beautiful area and what better way to explore than on foot or by bike. We have selected a few walks and cycling ideas for you. Some of these are accompanied by leaflets and maps in PDF format you can download and print off. A short walk through deciduous woodland and limestone outcrops with stunning Morecambe Bay views towards Holme Island and Arnside to the East and Humphrey Head to the South. 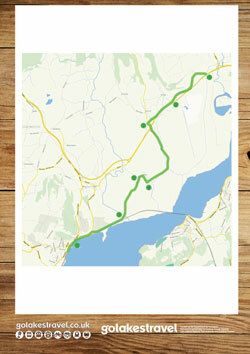 A selection of eight short walks from the Furness line. To find out more information on Cross Bay Walks please click on the link below. The dates are usually added in January/February for the year. A short walk around the most interesting spots in Grange. Grange & District Natural History Society have produced a series of tree walks in the town - these can be seen on a separate website here. There are a number of accessible nature reserves and woodlands on our doorstep. ​The Morecambe Bay Partnership has produced a super leaflet 'In and Around Grange-over-Sands', which includes suggestions for bird watching and walks. Adobe reader sofware can be downloaded free here if required. Grange Station makes a good starting point for cycling into the Cartmel Peninsula and the southern Lake District. 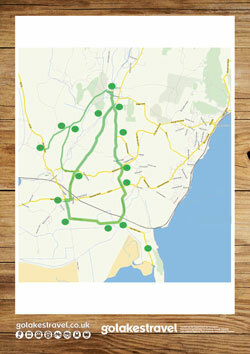 GoLakes have produced some cycle route maps as part of their Drive Less See More scheme. This route takes you eastwards along the Walney to Wear National Cycle Route to Gilpin Bridge - where you can link up with a Lyth Valley Circular Route.